Did you know the most common mistake made by many sales representatives that can cost them their relationship with prospective clients is sending out an impersonal written follow-up email. If you’re wondering why so few of your leads convert to paying clients, a lack of understanding of how to write an email to follow up on a proposal might be the reason. Look no further: We have the recipe for a successful follow up after a sales proposal right here. What Is a Follow-up Email After a Sales Proposal? The follow-up email is a vital stage of closing a sale. It can refer to a number of emails sent in a number of situations: after discussing the details of your potential deal via phone call, after sending the client documents to review with their respective decision makers, after meeting the client in person, and so on. In a perfect world, every lead accepts your business proposal immediately upon hearing it. They will instantly buy into the features and benefits of your product or service with very little footwork on your end. In the world we live in, it almost always takes a follow-up or two to sell your proposed solution. Or five. 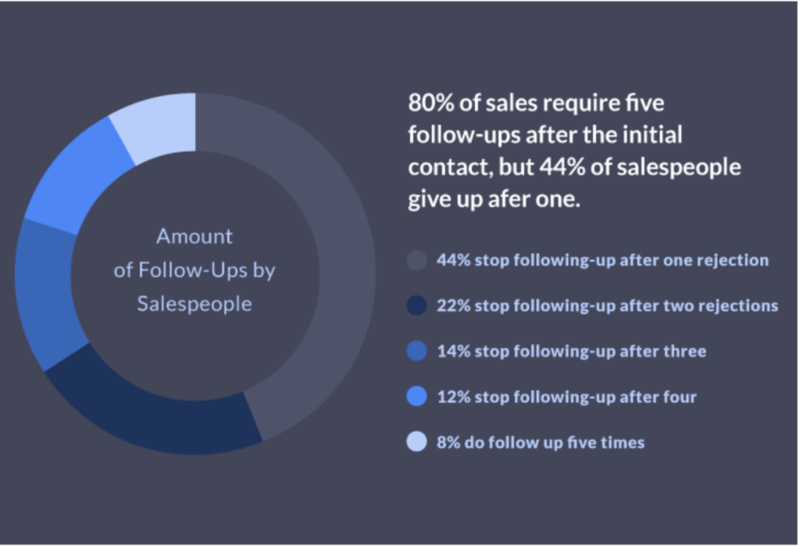 Indeed, research shows that 80% of sales deals take five follow up emails to close. That’s right: the client needs to be reminded of your existence not once, not twice — but five times. Unfortunately, most sales representatives give up after the first written a follow up email. Out of those that don’t give up, only 8% reach the five email milestone. This means 8% of salespeople close 80% of all deals. Of course, following up is not as easy as spamming the client’s inbox with half-hearted or overly aggressive pleas for attention. As customers, we’ve all received this kind of follow-up email; no matter whether there have been five of them (or 25, for that matter) they usually go straight into our spam folder. A proper follow-up email template takes effort and skill. Your goal is to grab your potential customer’s attention while getting them excited about the opportunity at hand without getting blocked or blacklisted. Every element of your follow up letter after sending a proposal has to be highly articulate and strategic. Your subject line matters. What you say and how you say it matters. The time of the day when you send the email matters, as well. Only a combination of successful tactics will help you get through to your prospect and finally close the deal. A successful follow-up email after a sales proposal is not only about delivering the right message to your prospect; it’s also about catching your potential client at the right time. The first thing to remember is that the people you are talking to have busy schedules. Expecting an immediate response to your email is not realistic; give the prospect some time to familiarize themselves with your product or service and to discuss the opportunity internally before you follow up – but don’t wait for too long, either. Three days are optimal to both show you respect their schedule and to keep yourself on their radar. 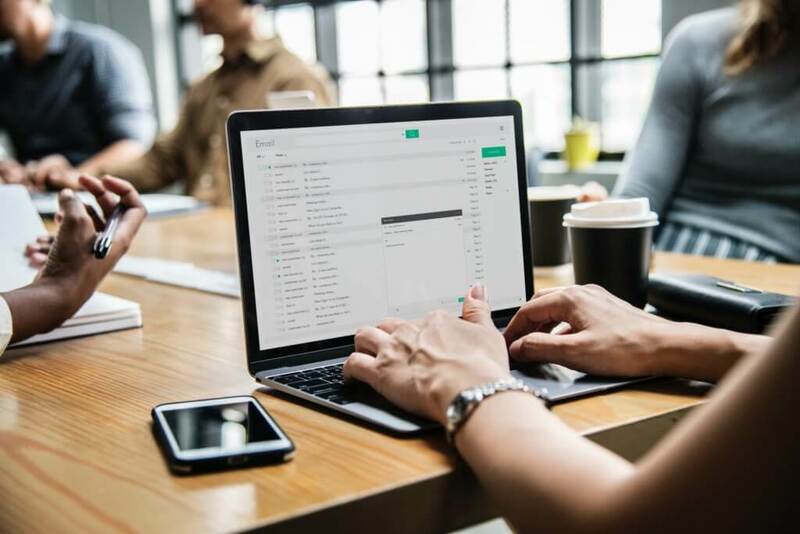 Here are some statistics for you to think over: research shows that business owners are more likely to open and reply to emails on the weekends. Office workers, on the other hand, are the most active during the working days, especially mid-week. Another thing to consider is the time of the day: emails received overnight or in the morning have the most chances to be seen and replied to. Base the timing of your emails or the type of customers you work with and don’t forget to account for time zones. It’s best if your follow-up emails are as unique as possible (ideally, tailored to the customer). Still, they need to follow a simple template. Attention-grabbing subject line – a good sales follow up email subject line can mean the difference between your email being opened or sent to the spam folder. Make it to-the-point and eye-catching. Clearly outlined purpose – “just checking in” is not the right approach to a follow-up email. Let’s face it — you are not just checking in, and the prospect knows it. Getting straight to the point will yield better results to your follow-up emails. CTA – always end your emails with a call to action: a question or an invitation to dialogue. It’s always useful to know whether the recipient is reading your letters or skipping them. If you haven’t been using email tracking software before, give it a try. Knowing what happened to your previous emails will help you modify your follow-up tactics. Depending on whether your previous email has been read, here are a few variations for the follow-up. If the email with the sales proposal was never opened, it does not necessarily mean the prospect is not interested. There might be any number of reasons they missed it, so a good follow-up could change the situation. The email you’ll send after a couple of days needs to include a short reminder of context, a summary of the first email, and a call to action. This is where the tactic needs to be changed. Modifying the first email won’t work anymore: you need to focus on a different approach. Point out the benefits your client will receive from your proposed solution that you may not haven’t mentioned yet. Make the call to action as obvious as possible. In this case, don’t wait three days before trying again. Send the follow-up email within several hours, while your proposal is still fresh in their mind. Start with asking if they have any questions and suggest discussing the offer through a personal meeting or a phone call. If your email has been forwarded to other people (such as key decision makers within your prospect’s company), it’s a good sign. However, nothing is set in stone yet. Help your chances by engaging those people in a conversation. Introduce your services in the same way you would normally do it with new prospects. 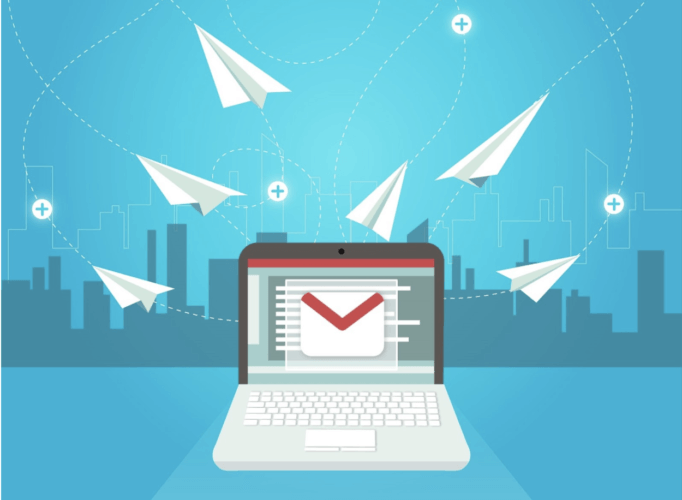 There are a few tricks to enhance your emails and a few things you need to steer clear of. Let’s go through them one by one to ensure that your follow up email after sending proposal hits the target. Stay on point – a brief letter has greater chances of receiving a reply. Try to fit your message into 100 words, max. Make your subject line specific – get their attention while also keeping your subject line clear and concise. Think of their needs – focus on how you can help your prospect — not on how to get something from them. Be intuitive – think about how this particular email would make you feel as a client and modify the text accordingly. Don’t push too hard – marking your emails as “urgent” or “top priority” will most likely just come off as annoying. Don’t scold the recipient for not replying – no matter the circumstances, trying to guilt your prospect into talking to you is not a good business tactic. Don’t send the same letter to everyone – every prospect is unique and needs a personal approach. The time you save by copying/pasting the email will not pay off in the long run. Don’t spam – we’ve already discussed the ideal spacing between emails. Knowing the difference between persistent and desperate is an important requirement for a good sales rep. Practice always wins over theory, so let’s view some examples of follow up emails that work. I reached out to you on [day] regarding [service]. Can we discuss the details over the phone/in person? If you are not available, let me know who is the appropriate person to talk to. Subject line: Enjoyed our conversation! It was great [meeting you in person/talking to you on Skype/phone]! 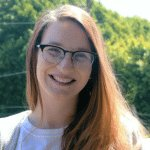 I’ve been thinking about the points you brought up regarding [challenges for client’s company], and how you would like to [client’s objectives]. Here is some information about the resources we have that can help you reach [business goals]. Let me know if you have any questions, and we can chat again on [date]. I’ve been thinking about the points you mentioned, specifically about [challenge]. In the not-so-recent past, we’ve worked with [another company] to reach a very similar objective. I’m attaching a [case study/reference] so you can see how it helped them. Let me know if you need any additional information, I’d be happy to help you. Just floating this email to the top of your inbox in case you missed my previous one. I understand your busy schedule, so no worries. Would you like to jump on a phone call on to discuss [business needs]? Does [date] or [date] work better for you? If your schedule is already packed, just let me know, and we’ll work something out. We are currently in the process of closing inactive files. As I haven’t heard back from you for a while, I assume you are either not interested or busy. Do I have permission to close your file if you’re not interested? If you are just busy, I can keep you on my list and we can schedule a conversation whenever it works for you. Let me know how it’s best to proceed. As a salesperson, it’s imperative to know exactly when your warm prospects are engaging with your email outreach. 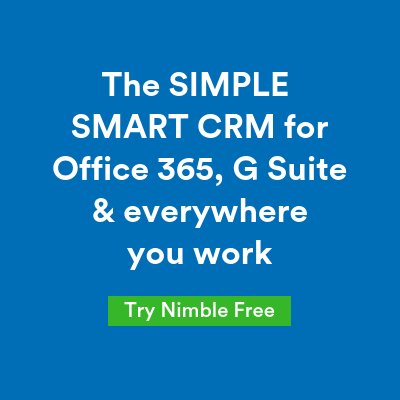 This is why Nimble’s new Email Tracking widget was designed to help you keep your finger on the pulse of all of your email activity by consolidating it in one easy-to-access platform, which can be easily accessed everywhere you work. It’s now simpler and faster than ever to follow up with your most engaged hot prospects and potential customers as soon as you sign into your Nimble account. With our Email Tracking widget, you’ll know exactly how your group email marketing campaigns and individual tracked messages are performing on the Today Page dashboard. If you’d like to see how it works try our free trial. The art of following up on a sales proposal is what makes the difference between a mediocre sales representative and a stellar one. It’s never easy to break through radio silence from a prospect, but there are surefire ways to increase your chances. Thankfully, learning the right approach is not a secret skill – all the key elements of a successful follow-up email are at your fingertips.